ABB Australia has launched the PickMaster 5 software for palletising applications, succeeding the well-known ABB FlexPalletizer system. 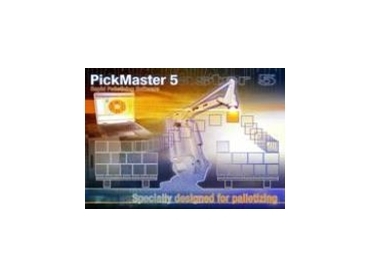 PickMaster 5 is especially designed for the packaging industry and palletising integrators. This new software is easy to use in a small or a large complex system. The user will intuitively learn how to choose patterns, how to present the boxes onto the pallet and use many other advanced palletising features. PickMaster generates the robot movements including advanced gripper functions and operates in harmony with simultaneous requests from surrounding infeed and outfeed stations. Derek Ford ABB Robotics segment manager - Food & Beverage, says: “PickMaster 5 supports single and multiple robot installations handling multiple product lines and feeding box dimensions and pallet patterns for any number of different formats. The application is configured by means of a graphical user interface on a standard offline PC in the familiar Windows environment. “The software serves the entire chain from object definition to the optimal selection of palletising patterns, building up entire pallets and calculating the most efficient robot movements. Users can inspect their results in rotatable three-dimensional views of the complete pallet matrix. PickMaster’s built-in flexibility, scalability and user friendly interface also allows rapid adaption to changes in production needs. Couple this with RobotStudio, ABB's 3D off-line simulation tool, and users can even view robot motion changes in a fully simulated environment before putting them in to use,” adds Derek.